I'm back from Ohio with two autographed thrillers to give away this week. Mike Lawson's House Justice is a Joe DeMarco thriller. When someone in Washington leaks the story of a CIA spy to an ambitious journalist, the spy is captured, brutally tortured, and executed. The director of the CIA and the Speaker of the House, John Mahoney, bring in Joe DeMarco, Mahoney's fixer. His assignment is to get the journalist off his boss's back, but he discovers there's an assassin following him, looking for the journalist's source. 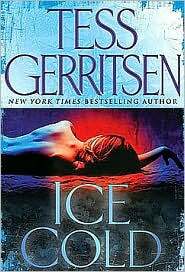 Ice Cold is the latest Rizzoli and Isles thriller by Tess Gerritsen. When, Boston medical examiner Maura Isles disappears on a ski trip, she's presumed dead. The search for Maura sets Boston homicide detective Jane Rizzoli on a dangerous investigation, searching for the secrets behind a cult, Kingdom come. You can enter to win both, but I need separate entries. Email me at lholstine@yahoo.com. Your subject line should read either "Win House Justice" or "Win Ice Cold." Your message should include your mailing address. Entrants only in the U.S., please. The contest will end Thursday, Sept. 9 at 6 p.m. PT. The winners will be selected by random number generator. I'll notify the winners and mail the books the next day. Good luck! I hope you can find this book for your father, or at least some of the others in Mike Lawson's series! I do want to enter this contest. I first saw this book in Goodreads but didn't win it. The author is good so I would love to read it. Just signed up for House Justice, this is right up my alley. Sent the email. Hi, House Justice looks really interesting and i can't wait to have a read of it. As a writer myself i am always looking out for good books to read.